It has to be the weather! Waking up and knowing it's going to be a warm day without a cloud in the sky! The sun shining is an instant happiness boost for me. If it's a warm summers day and I'm in about out of the garden - reading and sunbathing generally, I like to make up a batch of Lipton Lemon Ice Tea in a big jug with ice and keep it in the fridge. If you are lucky and have a world food aisle in your local Tesco you should definitely try it! I also love making a fruit smoothie in the morning for breakfast and sitting in the garden to drink it. I love going to the beach in summer for a picnic/BBQ though it's always way more crowded than I imagine. But Barbecues in my garden is the thing I love the most! I don't really change my makeup too much with each season. But for warm days I like to do a simple winged eye and a bold lip or stain depending on how warm it is. I discovered for hot days a good lip stain is my best friend for looking still made up even after my eyes have gone a little smudged. Pretty summer dresses all the way! I love skirts with black tights in winter but as soon as summer comes along I love wearing comfortable above the knee dresses (mainly from Primark as they always have so many lovely ones). Since discovering Melissa ballet pumps (which literally are indestructible and waterproof!) I wear them all year round - I have 6+ pairs now. So I continue to wear them come summer but I do love sandals especially with dresses and on holiday they are a must. Most days I'm lazy and stick my hair up in a high messy bun but if I take the time to straighten my hair or curl it with my Babyliss Conical Wand I do prefer how it looks. I always find a bold lip much easier even if it takes some maintenance during the day. I also feel like I don't wear bold lipsticks enough any other part of the year so I love delving into my lipstick drawer and deciding what I'm going to use. I love both Kiko and Clarins for super pigmented but hydrating lipsticks! I love, love, love wearing pretty floral and fruity perfumes in summer, even if the bees are attracted to me! My absolute favourite for the past two years has been Vera Wang Princess - such a creamy floral vanilla scent that is perfectly summery. Ohh, this is a tough one as I don't really think my music tastes change throughout the year. If I'm in a super happy mood, which is generally when it's a sunny day and I'm getting ready, I listen to a 90's playlist on Spotify - Savage Garden, Green Day, Alanis Morissette etc! But it's generally what's in the charts... do the charts even exist these days? Currently loving Happy by Pharrell, All of Me by John Legend and anything by Bastille. 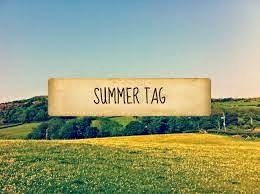 Who doesn't love a good tag? Whats your favourite thing about summer? Being able to wear pretty sandals and lovely clothes without having to hide it all under a big clumpy coat. I wish :( I'd love nothing more than to drink a lovely pure juice packed with ice cubes but my mouth just won't allow it and I'm still no closer to the cause. Favourite make-up look for summer? It would have to be the usual natural with no shadow etc, It all ends up dripping off because of the heat so anything more than that could end up quite messy. Dresses for me, Skirts always make me look and feel frumpy because of my sticky out hips and I just don't feel comfortable. It's got to be up, I get way to hot and frustrated with my hair down in the winter let alone the summer. Bold lips all the way for me. Favourite perfume for the summer? Last but not least, favourite music for the summer? Got to love abit of reggae too. feel free to leave me a comment with a link to your answers.